Posted on 10, November 2016 by EuropaWire PR Editors | This entry was posted in Aviation & Aerospace, Environment, Italy, Science, Technology and tagged Earth Observation Programmes, ESA, Fabrizio Giulianini, FLEX mission, Josef Aschbacher, Leonardo-Finmeccanica, ‘Earth Explorer’ Programme. Bookmark the permalink. FLORENCE, 10-Nov-2016 — /EuropaWire/ — Today (07/11/2016) Leonardo-Finmeccanica has signed a contract worth 74 million Euros with the European Space Agency (ESA) to create the FLEX spectrometer for the mission of the same name as part of the ESA’s ‘Earth Explorer’ Programme. From 2022 the FLEX mission will study the health of Earth’s vegetation from a satellite, gathering data that will have implications for Earth’s ecosystems and the maintenance of life on our planet. Leonardo will lead a consortium of European companies, including primary partner OHB System AG, to deliver the spectrometer. The consortium will spend four years designing, manufacturing and qualifying the system in Campi Bisenzio (Florence). The FLEX instrument will, from a height of 800km, collect the light emitted by plants and break it down into its constituent colours. The sensor can then identify the faint reddish glow emitted during photosynthesis, normally invisible to the naked eye, and precisely identify the ‘fluorescence’ of vegetation, allowing researchers to measure the health of Earth’s ecosystem. FLEX will orbit in tandem with the European Copernicus Programme’s Sentinel-3 satellite that itself is equipped with another Leonardo Space instrument, the SLSTR radiometer, which measures the sea and land surface temperature. The data will help meet challenges associated with climate change and the sustainable development of ecosystems and will also provide information of value to the agricultural sector. 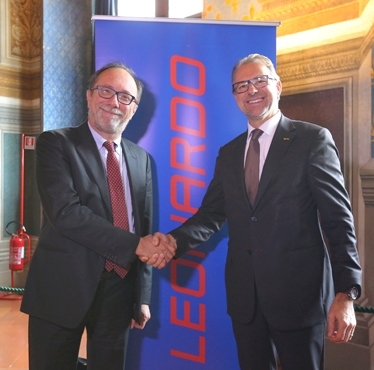 “This contract highlights Leonardo’s leadership in the market of electro-optical instruments for the Space sector. At our Campi Bisenzio site we have built, together with the Italian Space Agency and the scientific community, numerous high-tech tools for important international Space missions. From our laboratories, where we’re proud to have assembled some of the most skilled Space engineers and most advanced equipment in Europe, we’ve delivered electro-optical hyperspectral and multi-spectral sensors that have won business competitions worldwide” – said Fabrizio Giulianini, Director of Leonardo’s Electronics, Defence and Security Systems sector. “This mission will be the next important step in ESA’s Earth Observation Programme. Like its predecessors it will be a marvel of European space technology. It will deliver a completely new type of data to European scientists and will pave the way for a better understanding of the role of vegetation on Earth” – said Josef Aschbacher, ESA Director of Earth Observation Programmes. With a wide range of skills, from the development of hi-tech space equipment and sensors to the supply of satellite services, to the production of satellites and orbiting structures, Leonardo has a leading role in all the most significant international Space missions for Earth observation, satellite navigation, meteorology, planetary exploration and scientific research. These missions include Copernicus, Galileo, COSMO-SkyMed, MetOp Second Generation, Meteosat Third Generation, Rosetta, BepiColombo, Venus Express, ExoMars, Dawn, Juno, JUICE, Cassini, New Horizons, Euclid and LISA Pathfinder.